VEGAPULS 62 Radar For Liquids - HiTECH Technologies, Inc. The Universal Genius for Liquids Measurement. 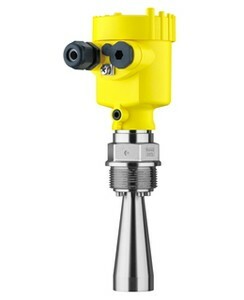 The radar sensor VEGAPULS 62 handles difficult process conditions like extreme temperatures, overpressure or vacuum effortlessly: the instrument reliably measures the liquid level in storage tanks and process vessels in process temperatures from -200° C to +450° C. Process pressures of -1 bar to +160 bar are no problem at all for the instrument. The version with horn antenna is especially suitable for measuring products like solvents, hydrocarbons and fuels. When equipped with a parabolic antenna, the instrument is particularly suitable for level measurement of liquid media with low εr value at large measuring distances. The VEGAPULS 62 is a universally implementable radar sensor for continuous level measurement of liquids. It is suitable for level measurement in storage containers, reactors and process vessels, even under difficult process conditions. With its various antenna versions and materials, VEGAPULS 62 is the optimal solution for almost all applications and processes. Its wide temperature and pressure range makes project planning simple.